Teosyal Redensity1 is an innovative new product that is injected into the skin using a technique that is very similar to that performed in Mesotherapy. Mesotherapy is a treatment where tiny multiple injections of homeopathic solutions, vitamins and other ingredients are injected into the skin for various cosmetic reasons. Teosyal Redensity1 uses the same principle of microinjections into the skin to feed the skin with hydration and luminosity. Lasting Looks Anti-Aging & Laser Clinic has seen great results with patients skin who have been treated with Teosyal Redensity 1. 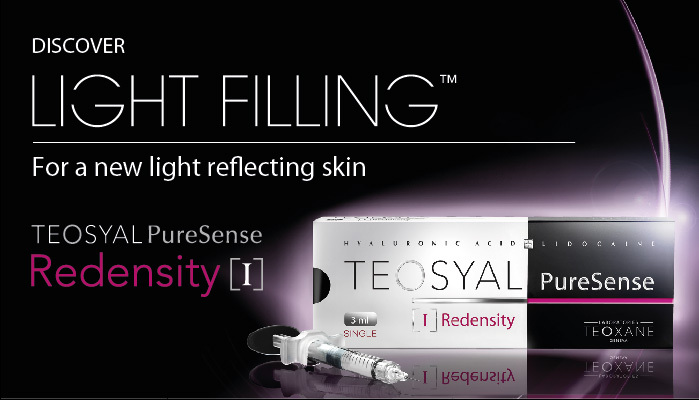 Teosyal Redensity 1 is not a traditional dermal filler but an injectable product uniquely cross-linked containing Hyaluronic acid and a proprietary Dermo-Restructuring Complex solution exclusive to Teosyal. Results with Redensity 1 are quite impressive, as it helps to eradicate dull dry uneven skin & fine lines even after the very first treatment. Generally three treatments per area are suggested at three week intervals.